Print, copy, scan and fax on a wide range of paper sizes up to 11" x 17". The MFC-6890cdw also includes duplex printing at 8.5" x 11", wireless (802.11b/g) and Ethernet network interfaces and a TouchScreen 4.2" color LCD display. Work more efficiently with 350-sheet total capacity dual paper trays and high-yield ink cartridges. Automatic Duplex Printing. Save paper with duplex printing at 8.5" x 11"
4.2" Color TouchScreen LCD Display. Easy to use and interactive. Print photos directly from your digital camera's media cards, PictBridge-enabled camera, or USB Flash Memory. Built-in Wireless & Wired Interfaces. Flexible wireless (802.11 b/g), wired (Ethernet) network connections. High Capacity Paper Handling. Dual paper trays provide a total of 350-sheet capacity. Tray 1 holds up to 100 sheets of 3.5" x 5" to ledger 11" x 17" sized. Tray 2 holds up to 250 sheets of letter 8.5" x 11" up to ledger 11" x 17" sized paper. Versatile Auto Document Feeder Unattended fax, scan or copy using the up to 50-sheet auto document feeder. Secure Function Lock. 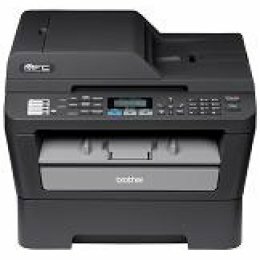 Allows you to restrict public access to certain machine functions such as Fax, Copy, Scan and Print. Professional Print Resolutions. With droplet sizes as small as 1.5 picoliters and high resolutions up to 6000 x 1200dpi. High Yield 4-Cartridge Ink System. Both standard and high yield ink cartridges are available. Our efficient 4-cartridge system means that you only change the cartridge that needs to be replaced.